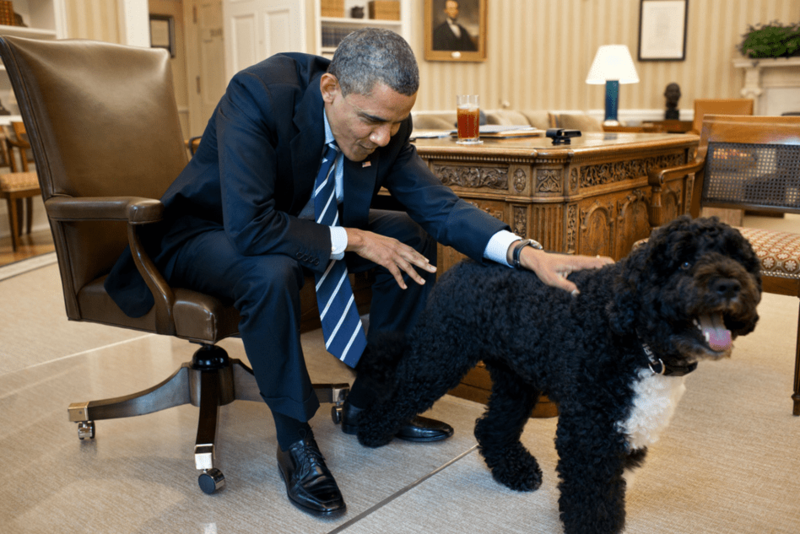 President Barack Obama pets Bo, in the Oval Office, June 21, 2012. 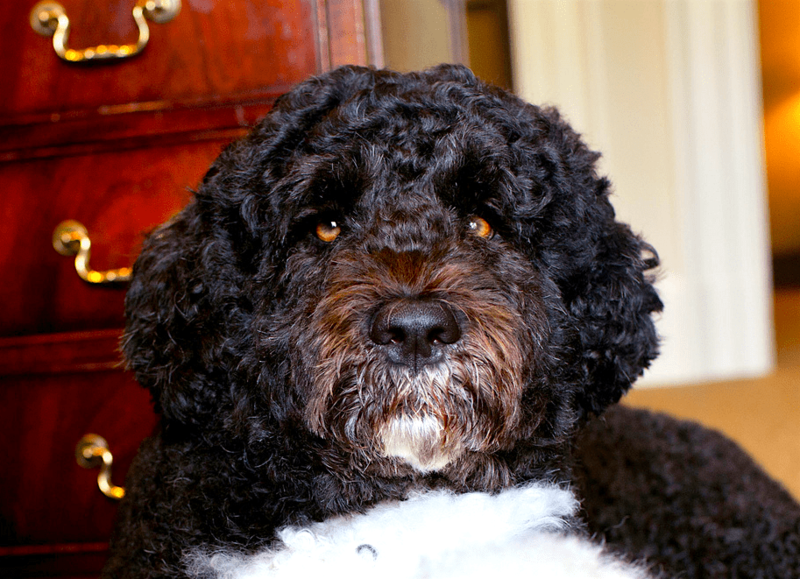 Bo Obama, a Portuguese water dog, seems to have been destined for a place in the White House. Born in Texas on Oct. 9, 2008, Bo was originally named “New Hope” by breeders Art and Martha Stern. The Sterns were avid Obama supporters and gave the puppy the same name as presidential candidate Barack Obama’s campaign slogan. Little did they know how prophetic this adorable puppy’s name would be. New Hope (Bo) was actually adopted by a different family, but he was returned to the breeders after a few weeks for reasons unclear. All the Sterns would say was, “It was not a problem with the dog.” But from the start, Bo had an affable, easygoing personality. When President Obama was running for office, he promised his daughters, Sasha and Malia, that should he win, they would get a puppy. When he was indeed victorious, Senator Ted Kennedy and his wife gifted the dog to the Obama girls on April 14, 2009. A closeup of Bo, June 20, 2012. The country took to Bo right away, with his photo going viral within days. You can also find Bo Obama plush toys (affiliate link). 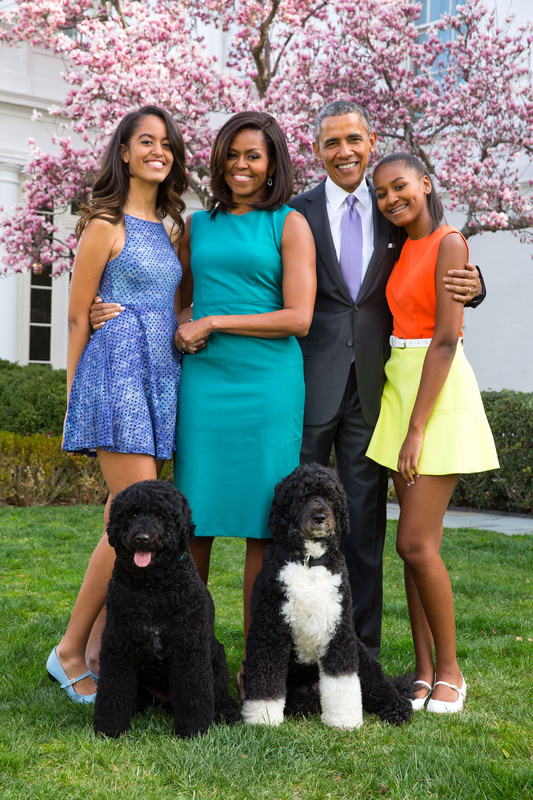 President Barack Obama, First Lady Michelle Obama, and daughters Malia and Sasha pose for a family portrait with Bo (white patches of fur) and Sunny (tongue sticking out) in the Rose Garden of the White House, April 5, 2015. Life is good for Bo, but it’s not all play — he takes his duties as First Dog very seriously. He travels with his family, including little canine sister Sunny, all over the globe via Air Force One. Bo enjoys meeting foreign dignitaries and overseeing proceedings in the Oval Office, but he also enjoys helping Michelle Obama when she reads to children. He usually steals the spotlight. During the First Lady’s reading of The Night Before Christmas to some children at a hospital, Bo jumped right into her lap. 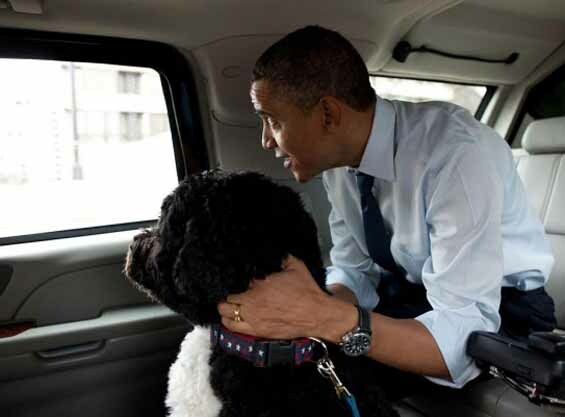 President Obama and Bo taking a ride in the presidential limo. Throw Him a Bone, Won’t You? Being the First Dog can be dangerous, though. In January 2016, Bo and Sunny were the target of an apparent kidnapping plot. Luckily, neither dog was harmed and the Secret Service arrested the suspect. In his downtime, Bo enjoys playing football with President Obama, stealing the First Lady’s lap space, and playing in the snow. He loves going for walks with his whole family, then taking long naps near one of his family members. Despite his breed name, Bo does not know how to swim! Perhaps that’s something he can tackle on the Obamas’ next trip to Martha’s Vineyard. 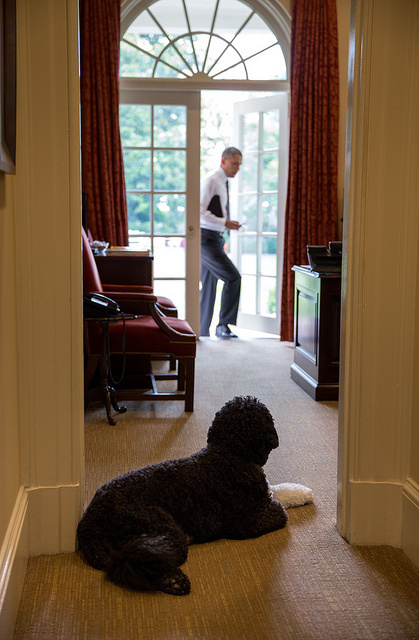 Bo waits to greet President Obama in the Outer Oval Office, June 11, 2013. I love getting Christmas cards from president Obama. They always have the most precious pictures of their dogs. They are always having fun!